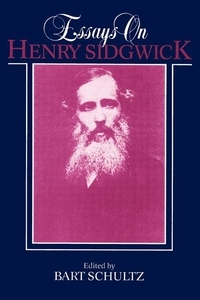 Henry Sidgwick is one of the great intellectual figures of 19th century Britain. He was first and foremost a great moral philosopher, whose masterwork The Methods of Ethics (1874) is still widely studied today. But he was many other things besides, writing on religion, economics, politics, education and literature. He was deeply involved in the founding of the first college for women at the University of Cambridge. He was a leading figure in parapsychology. He was also much concerned with the sexual politics of his close friend John Addington Symonds, a pioneer of gay studies. Through his famous student, G.E. Moore, a direct line can be traced from Sidgwick and his circle to the Bloomsbury group. Bart Schultz has written a magisterial overview of this great Victorian sage--the first comprehensive study, offering quite new critical perspectives on the life and the work. Sidgwick's ethical work is situated in the context of his theological and political commitments and is revealed as a necessarily guarded statement of his deepest philosophical convictions and doubts. All other areas of this writings are covered and presented in the context of the late Victorian culture of imperialsim. This biography, or 'Goethean reconstruction' will be eagerly sought out by readers interested in philosophy, Victorian studies, political theory, the history of ideas, educational theory, the history of psychology and gender and gay studies. Bart Schultz is Fellow and Lecturer in the Division of the Humanities and Special Programs Coordinator in the Graham School of General Studies at the University of Chicago.